These are an easy and yummy Halloween themed snack. They were a big hit with the boys and hubby! 1. Make orange jello according to package. Pour into glasses and fill about halfway. 2. Set in fridge to set. 3. Make yellow jello according to package. 4. Let sit in pan to cool, to about room temperature but not set yet. 5. 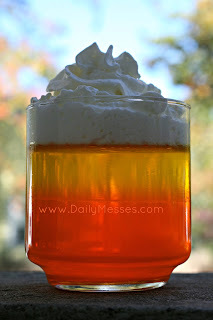 Once the jello is cool, pour on top of orange jello and place in fridge to set. 6. Right before serving, top with Reddi-Whip.